Beautiful sunny days spent exploring in South Africa offer you adventure and romance in this eclectic region with superb wine tasting and spectacular coastal scenery against towering mountains. End on the magnificent islands of Seychelles for an unforgettable beach vacation. Your safari experience: Start your stay in South Africa with an unforgettable stay in Cape Town, one of the most beautiful cities in the world, with private tours created to your personal tastes and interests by Into Seychelles specialists. Fly to Singita and experience a luxury safari in Southern Africa’s most exclusive private game reserve and luxury lodge. Expertly guided game drives conducted in the morning and afternoons, leading into evening drives take you through game-filled wilderness to encounter lion, leopard, elephant, rhino and much more. Experience the very best of African metropolis, safari and beach on this memorable vacation. One of the world's most beautiful cities, Cape Town is a natural spectacle in an enchanting corner of South Africa. Experience trendy nightlife, beautiful sightseeing and world-class hotels and dining in the vibrant Cape. The Ellerman House is a boutique luxury hotel in the elite suburb of Bantry Bay, perhaps the most exclusive and greatest of all luxury hotels in South Africa, yet it remains a secret hideaway. The service is uniquely distinctive, surpassing every luxury Cape Town hotel in quality, exclusivity of location, excellence in service and renowned standard of luxury. 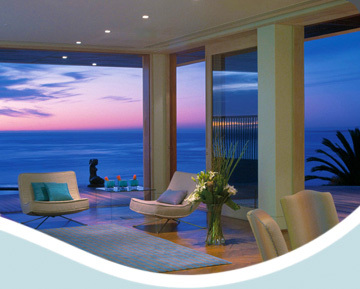 A fine luxury home in Cape Town, Elleman House has blossomed under the care and devotion of its original owners. Many gracious living rooms flow onto sweeping verandas and patios offering unsurpassed views across the Atlantic Ocean to Robben Island – a privileged pleasure also enjoyed from the private balconies of the exquisite Eleven suites in the House. Relaxation is also found in the stately restaturant, bar and library, where guests enjoy the finest known private collection of antique and rare South African Wine and Art. The Ellerman House is one of only two Relais & Chateaux hotels in Cape Town and one of only 14 Purple shield-status hotels in the world. The elegant Ellerman Spa offers color-therapy steam bath, sauna, infinity pool and opulent massage treatments. A picturesque French Provençal country villa in Franschhoek: Modeled after a French Country Château, on 30-acre working vineyard, La Residence offers eleven luxuriously appointed suites; each representing the ultimate in contemporary luxury, with fine antique treasures personally selected from around the world, exquisite Persian carpets and an eclectic mix of objet d'art. Admire the stretching views of mountains and vineyards, and enjoy the delicate scents of nature from the Villa's expansive patios. The grand living areas open onto a cloistered courtyard with a stylish Mediterranean-style pool. A detached home theater and private library add to the secluded splendors of the villa. The regal suites at La Residence feature a King-size four-poster-bed master bedroom, study, private balcony, his and hers dressing rooms in a palatial bathroom with claws-foot tub and panoramic views of the surrounding Franschhoek Valley. Franschhoek Valley is the epitome of South African wine and gourmet cuisine with some of the countrys Top 100 restaurants and world-renowned chefs. The quaint town of Franschhoek is a beautiful experience with cute bistros, eclectic galleries - and even a Belgian chocolatier lining the main street. Explore the Cape Winelands with a private guide and car to yourself for wine tasting & personal behind-the-scenes tours with winemakers at the region's award-winning vineyards. A quintessential Cape experience not to be missed! Enjoy preferential seat allocation and worldly comforts aboard the Air Seychelles Pearl Class service. Sample culinary delights from International and Seychelles Creole cuisine and private in-seat entertainment to Seychelles from South Africa.